With almost 9,000 buildings built before 1900, Bed-Stuy has a vast collection of intact Victorian architecture that is luring pioneers to this neighborhood. As it is only now emerging from a long period of economic woe, these treasures have not been destroyed by misguided trends of the past. Little by little, they are being snatched up and restored, along with the neighborhood, to their full glory. Critically acclaimed restaurants, wine stores, and bars have followed. An eclectic mix of students, architects, lawyers, and long-time residents gives Stuyvesant Heights color. Block parties, street festivals, and Sunday morning church services all showcase the strong community spirit. Culinary choices mirror the diversity of the population; Ali’s Trinidad Roti Shop sits next door to a new American restaurant. Ownership of David’s Brisket House was passed from Jewish immigrants to a Muslim partner. 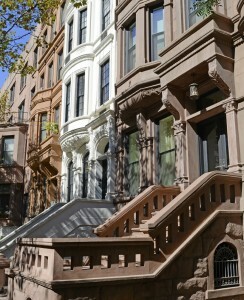 The neighborhood is made up mostly of three and four story brownstones and row houses, with the occasional new condo development squeezed in. Sections of the neighborhood have been designated landmarked historic districts. For now, money goes farther here than in other brownstone-laden sections of Brooklyn. Bed-Stuy is served by the A, C, G, J, M, and Z subway lines. It’s about 20 minutes into Manhattan from the subway, but some parts of the neighborhood are a bit of a hike to the subway.